I was looking for Gareth Pugh collar DIYs and came across this article! I think its so neat! “The future of fashion and the future of car design”. 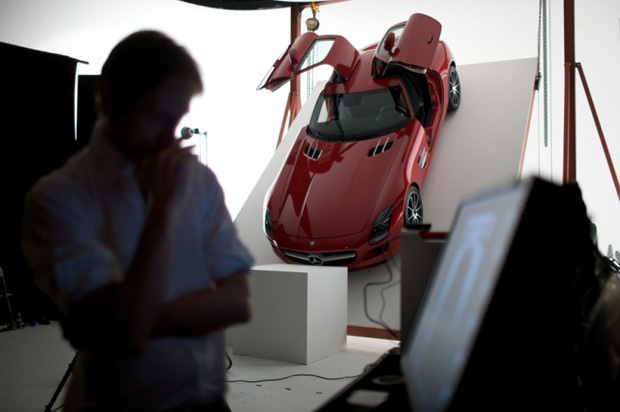 Designer Gareth Pugh teamed up with Mercedes-Benz and photographer Nick Knight to bring something so amazing together. I think its a bit of a risk for Mercedes to use such an abstract designer, he doesn’t follow trends, or what the average customer wants, he’s on his own track, but people actually love it! Not like anyone average can afford a car or a garment like that, but its still so neat to see something so creative. Here’s a couple photos and a behind the scenes video. You know what I noticed? Gareth Pugh is channeling Christian Dior’s “New Look” with the hip plates, and Alexander McQueen through the shoes, they remind me of the Armadillo shoes he featured in his Spring 2010 collection. This entry was posted in Uncategorized and tagged 2010, alexander mcqueen shoes, armadillo, gareth pugh, mercedes sls amg, nick knight. Bookmark the permalink.